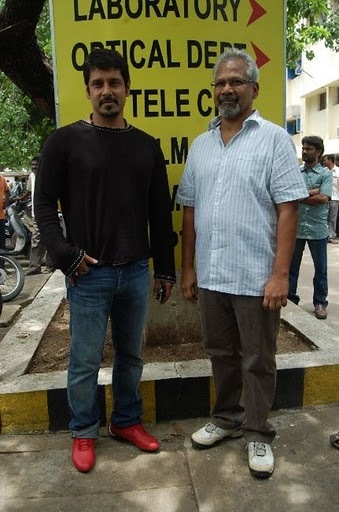 Home » Latest Buzz » Manirathnam coming up with a Multistarrer Subject with Chiyaan Vikram? Manirathnam coming up with a Multistarrer Subject with Chiyaan Vikram? Ace director Manirathnam who gave many super hits is coming up with another enthralling film. This time he is doing a multi starrer with Hero Vikram and Tollywood’s prince Mahesh Babu. The story is based on the famous Tamil historical novel “Ponnian Selvam”. Ponnian Selvam”is widely known as the greatest novel ever written in Tamil. It deals with the fortunes of the Chola empire during the 10th century. This going to b a historical, romantic, spy thriller film. If the buzz is true Vikram will be doing the role of Raja Raja Chola, while prince Mahesh Babu will be acting in the role of the Pallava king. The dialogue writer of this film Jayamohan is being paid a huge amount or Rs. 2 crores for penning the dialogues. For the ever first time in Indian cinema that a dialogue writer is receiving such huge amount as remuneration. This flick is produced by Kalnidhi Maran under Sun Pictures banner.